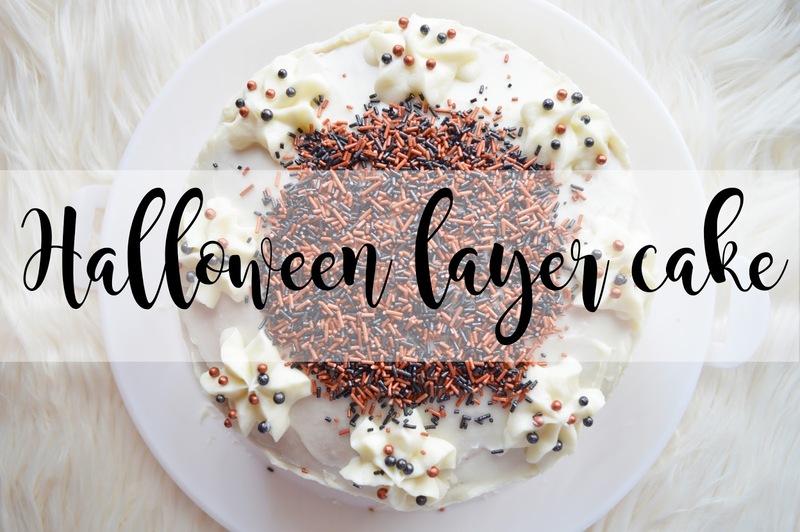 I do not celebrate Halloween however I love baking so this was the perfect opportunity to create something with a Halloween theme which you can all make too! (Or get inspiration from). I absolutely love this cake! It's easy to spread frosting onto, it doesn't fall to pieces and it's fluffy, light and absolutely grogeous. I love how easy this cake is to make and it doesn't take long to make either! Plus you do not need a fancy stand mixer to make this, you can easily use a wooden spoon if needed! Preheat oven to 180 degrees celcius and line three 7 inch cake tins. Cream together the butter and sugar, you can do this with an electric hand whisk, stand mixer or with a wooden spoon, until it is light and fluffy. Add the vanilla extract and mix again. Then add the eggs one at a time, mixing till combined. Sift in the plain flour and baking powder, and mix till everything is incorporated and smooth. Pour evenly into your prepared tins and bake in the oven for 23-25 minutes or until a skewer comes out clean. Leave to cool in the tins for 5 minutes and then transfer to a wire rack to cool completely. Once the cakes cooled I placed them in the fridge to cool even more so when it came to icing them, they were fairly hard and it was easier to ice. Add all of the icing sugar and mix slowly at first so you do not end up with a cloud of sugar, and then gradually turn the speed up until the mixture has no lumps in. Take the first layer of cake out of the fridge and spread an even layer of frosting across the top and then place the second layer of cake on top, pushing down to ensure any excess frosting comes out. Apply another even layer of frosting and add the third layer of cake, pushing down again. Place back into the fridge to further cool. After ten-twenty minutes, take the cake out of the fridge and ice the top and sides of the cake until you're happy with how it looks. Using any icing tip you'd like to use, use the rest of the icing to pipe around the top of the cake. Add halloween sprinkles to the middle of the cake, and sugar balls on top of your piping. Once you're happy with how it looks, place back into the fridge! I think this cake would have looked absolutely beautiful with orange icing, but the amount of food colouring you need to change the colour of the icing, the taste completely changes and all you can taste is the horrible flavour of the colouring which isn't ideal! If you can find a ready made orange frosting, I highly recommend using this, it would look fabulous! Let me know if you make this! I'd love to see your results! This look so delicious, we love to try baking but our never happy with our presentation but I do think Halloween is a good reason to try some baking! Thanks for sharing!